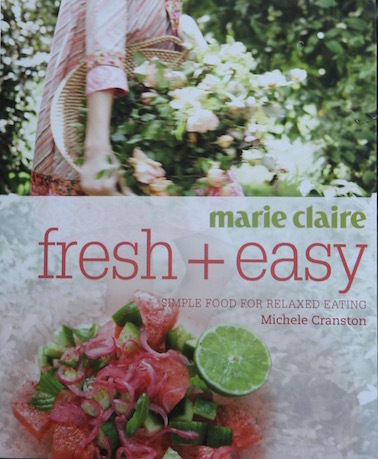 Marie Claire fresh and easy: simple food for relaxed eating, 256pp. This recipe came to me in an unexpected way. A little while ago, Déwi invited Poor John and me to join her and her two daughters for dinner. I’ve known Déwi since she was a teenager. That’s when I first came to Australia and lived next door to the wonderful Adam family. I was completed blessed and Déwi’s mother, Ronnie, was like a sister to me. Last year, we lost Ronnie to a tumour when she was way too young. But I mustn’t linger in sadness. 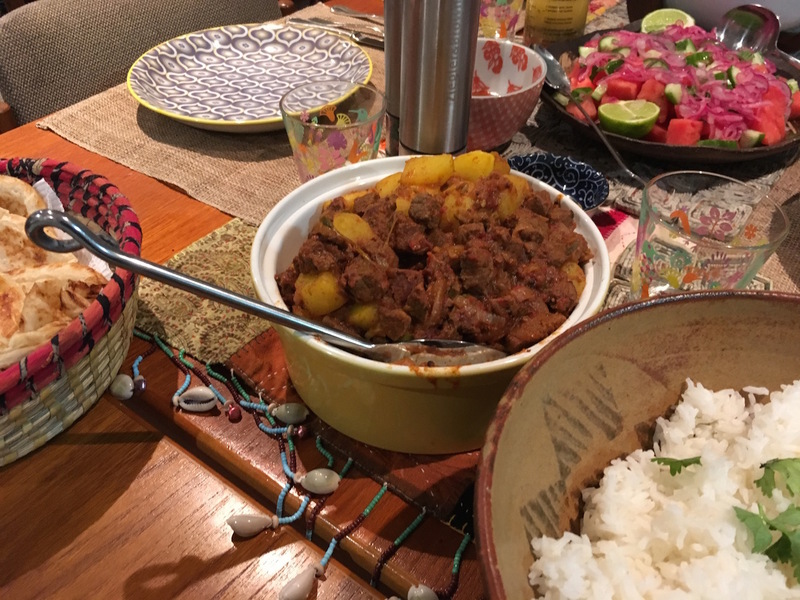 Sharing dinner with Déwi and family was a special treat, and imagine our surprise to discover that the main dish she was cooking was from pages 132–33. Put the potatoes in a large saucepan and cover with water. Add the turmeric powder and 1 teaspoon of sea salt and bring to the boil over high heat. Reduce the heat to low, cover and cook for 15 minutes or until the potatoes are cooked through. Drain and set aside, reserving some of the liquid to add to the curry later. Put a heavy-based frying pan over medium heat and add 1 tablespoon of olive oil and the ginger, coriander, mustard seeds, fennel seeds and dried chilli. Cook for a minute or until the spices are aromatic, then add the onion and the remaining olive oil. Cook the onion until it is soft, them remove it with a slotted spoon. Add the beef to the pan and cook, stirring occasionally, until the meat is browned. Return the spiced onions to the pan, and add the green chilli, tomato paste and tomatoes. Reduce the heat to low, cover, and allow to simmer for 30 minutes, adding some of the reserved potato water if necessary. Add the potatoes at the last minute and cook for a further minute. 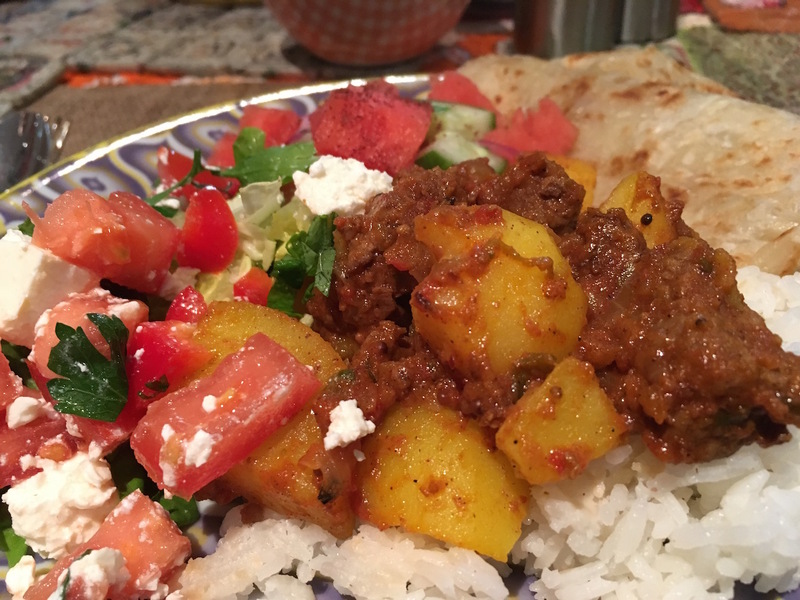 Serve with steamed rice or couscous. Serves 4. We arrived 20–30 minutes before dinner was served, so I can’t claim to have watched (or photographed) the cooking process. I simply asked ‘What are you making’. 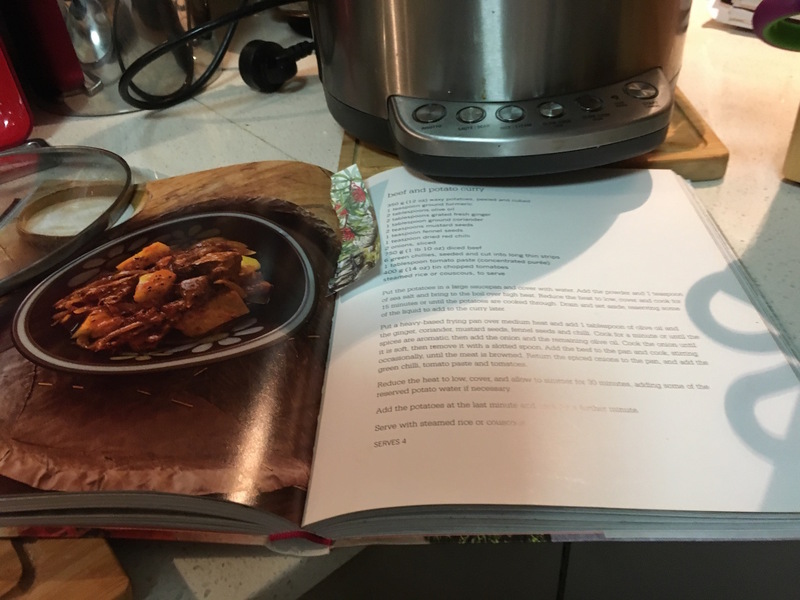 Demi showed me the cookbook and I instantly spotted the magic number 32. Déwi said she followed the ingredients and instructions as written. She found everything to be straightforward. It was a wonderful meal in every way. 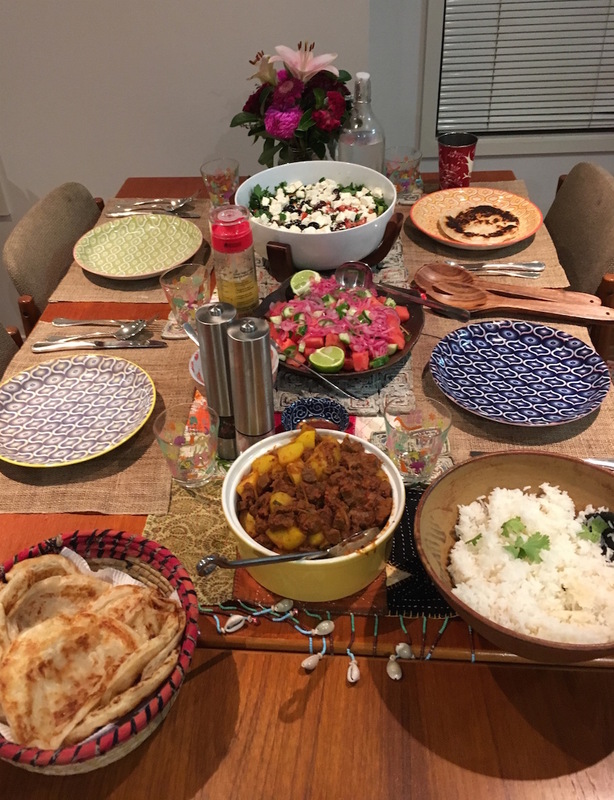 Delicious food—including the curry, steamed rice, two colourful salads and parathas—perfect company, lots of laughter and the sharing of many memories. As it turned out it was the 21st anniversary of the day Déwi served as postmistress in the small Japanese village she was living in at the time. We’ve promised to get together again soon. 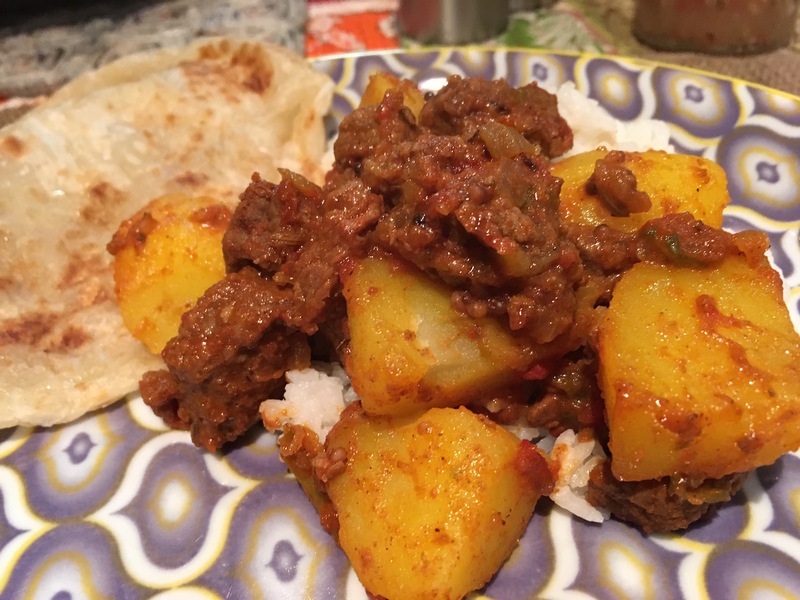 This entry was posted in Main dish, Meat, Vegetable and tagged beef, dried chilli, fennel seeds, ginger, green chillies, ground coriander, Indian, mustard seeds, olive oil, onions, potatoes, rice, tomato paste, tomatoes, turmeric. Bookmark the permalink. Yes, it’s a very good recipe. Even better shared with friends. Peggy, this looks absolutely delicious and includes the wonder spice, turmeric. Did Dewi shred the beef or did that happen as it cooked? 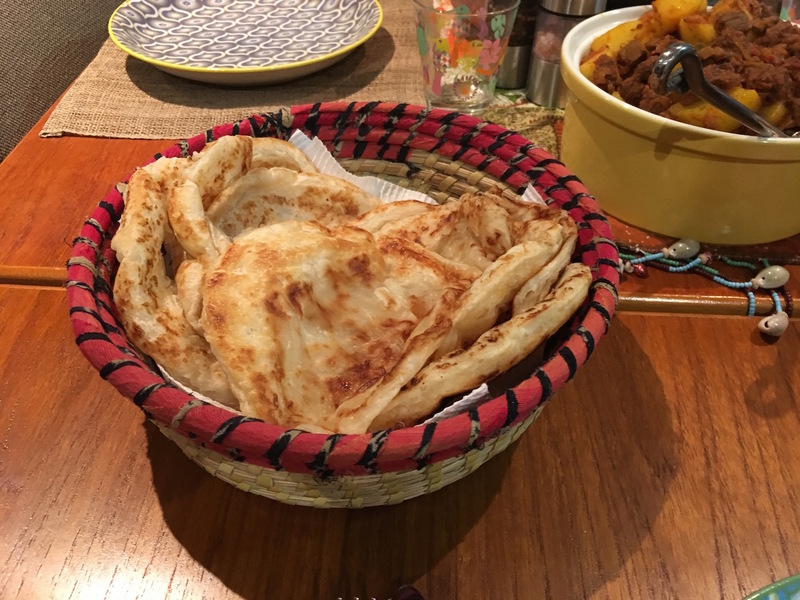 It seems you also had naan which looks like a perfect accompaniment. Two questions, please: What kind of chilies? And, was this very spicy? I’m going to wait till the weather cools (please cool) and then I’m going to try this recipe for my family. Hi Sharon, I suspect the meat just breaks down over cooking, as I noticed that Déwi didn’t shred it. Chilli-wise she used dried red chilli flakes and the long green chillies which are fairly mild. We didn’t find the dish particularly spicy, but I always tell people to halve the chillies if they think it might be too hot and then work up from there. Either way, I bet your family will love it. P.S. I use a lot of turmeric. Please accept my condolences on the loss of your friend, Ronnie. I just looked up parathas and found it’s similar to naan. There’s a great Indian deli nearby where I can get naan. Thanks Sharon. We all miss Ronnie so much. She was a tremendous person. Yes, parathas and naan are very similar. Parathas are thinner than naan, but thicker than roti. Anything with chilli and turmeric is bound to be great. Our bowling club avoid eating at Thai or Indian restaurants. I don’t get it. Mind you, I am the only foreigner. Perhaps the sport of bowling attracts those with more conservative palates? Yes, we’re suckers for turmeric and chilli, with Thai and Indian being very popular. But I guess people don’t ‘get’ those flavours if they’ve never been exposed to them. I’ll be trying this Peggy although I might swap the beef for lamb. Do you think it will still work? Also, with that many chilies, will it be really hot? It wasn’t super hot, but it’s easy enough to cut the amount of chillies in half for the first time you make it. Also lamb or beef should work equally well. Dinners with friends are special The recipe looks wonderful. It’s a great recipe. Yesterday I bought beef so I can make it at home. Thanks. It seems the link isn’t working.